like the cool light film of a solar eclipse. Maybe these trees begin their reign as wood deities. For sure, they are not reining themselves in. that soon enough medicate our grass and flower beds. Some declare the golden rain tree a noxious invasive. We know this, but we have other labels. winter crops line our roadways with electric green. that the earth is indeed tilting on its axis. first golden, then pink, turning orange, oranger, orangest. Here is our seasonal salvation, eye candy for autumn. © by Jan Epton Seale. 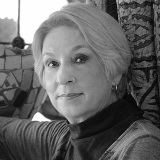 Jan Epton Seale was the 2012 Texas Poet Laureate. She is the author of nine volumes of poetry, two books of short fiction, three volumes of nonfiction, and nine children's books. The recipient of a National Endowment for the Arts Fellowship in Creative Writing, Jan taught English and creative writing at the university level for many years and now teaches memoir and creative writing workshops all over the country. Mother of three sons and grandmother of four grandsons, Jan lives in South Texas, where she volunteers at a local environmental center. Learn more about her at www.janseale.com. What lovely images. Your poem made me smile. What tree and what fruit are you describing in the Australia of Texas? Excellent! A delight to read (aloud, of course) and the images it plants in my mind remain vivid as a lawn awash will fallen leaves. The golden rain trees! One of my favorites~'autumn eye candy'. Love this poem. Thanks, Jan.